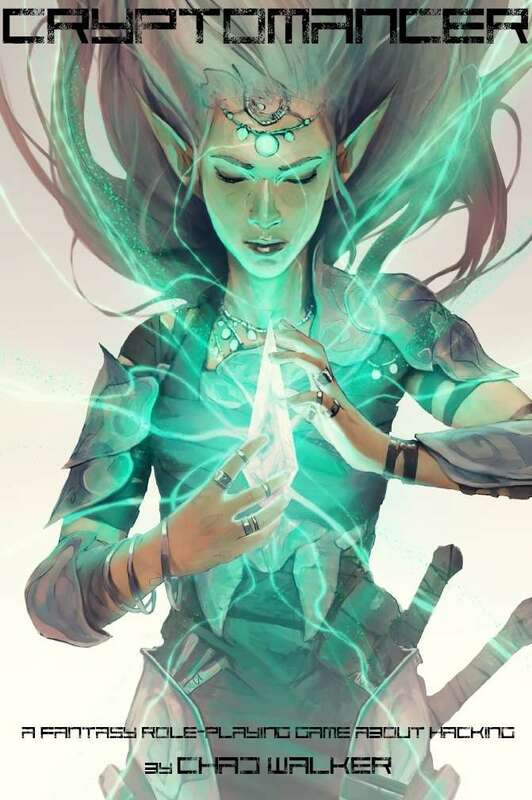 Cryptomancer is a tabletop role-playing game made for hackers, by hackers. It features an original fantasy setting and gameplay informed by diverse security disciplines: information security, physical security, intelligence analysis, clandestine tradecraft, and risk management. Players assume the role of characters on the run from a shadowy organization that rules the world through mass surveillance, propaganda, and political coercion. Kill all the orcs, hack all the things! So I have both the core book and the CodeDagger 1. I was wondering if you had any plans to continue the franchise or is it basically done? I would like to see more. Code and Dagger 2 came out. It's free on DriveThru if you bought the core book, but contact me via the game's webpage and i'll hook you up if you need it. hello, i have a question more about the setting, was it more or less inspired by .hack or Sword Art Online ? just currious. No. It's typical fantasy role-play (kill things and take their stuff) re-imagined with systems engineering goggles. It has absolutely no "virtual reality" or "digital alternate reality" component at all. I see, at first glance it looked like it, thanks for you for the answers. I see two PDFs with the same Cryptomancer titles, and at a quick glance I don't see anything different in the two. They are both black and white, have the same 430 pages, and the same Table of Contents, so what is the difference in the two PDFs? One *might* contain bookmarks(?). Honestly, I didn't want to remove either in case it somehow would negatively impact availability of the download. Both have the same MD5 hash, and so are exactly the same. A purchase of Cryptomancer now includes Volume I and II of "Code & Dagger," the official Cryptomancer sourcebook. That's really cool. But I assume these Volumes are not included in a POD of the core book, are they? I'm truly puzzled as to why the game's description isn't more transparent about being a death spiral, or at least why it doesn't take some pains to emphasize the inherent hopelessness of the setting. If I hadn't read multiple reviews both on and off this site I'd have assumed it was a more neutral, or even player empowering game, would likely have bought it, and been left a very unhappy customer. That's simply not my game. There IS a very solid market for those who enjoy a doomed struggle, and thus no need to conceal or obfuscate the setting's nature. I'm disappointed that I had discover this via third party commentary. Edit: I am aware of the free expansion as mentioned in the publisher's reply to Carsten H.'s review of the game, but I still maintain that this product would better serve itself and its buyers by being upfront with the game's nature. Agreed. I read of the downward spiral and instantly knew: I can't play it with my players like that. They know the risk of character death, of course, but they want to be able to be victorious in the end. Hi Sascha! Thanks for supporting the game! An easy hack to make the game more heroic for the table is to replace Risk Eater assassinations with "Big Campaign Events"... the arch-duke gets assassinated, a zombie pandemic happens, orcs invade, etc. Oh wow, that's actually really clever. As someomne who's enthusiastic about cryptography, I'm so happy you guys did this book. I surprised myself with the pdf to commemorate the raise I just got. I do wonder if you guys plan to come up with cryptographic themes in a more modern environment - like a cyberpunk setting in the near future, or in a fictional scifi world. Playing out the themes of a survailence state vs. anarcho-cryptographic movements, the now so important dilemma between security and privacy, would be tons of fun. AND educational on both cryptography and modern problems as well. I can imagine a Snowden-style whistleblowing story as a quickstart adventure. I bet it would sell great, and would start important discussions around players. Well, I'm most certain I will have tons of fun with Cryptomancer as well! Thanks Gyurics! We're pleased you dig the game. The chapter called "The Father of Space and Time," and the game's Outro, are basically a fantasy retelling of the Snowden story. I hope you enjoy. We're working on something modern, high budget, and totally outrageous, and hope to launch by end of 2017. Stay tuned. As someone who knows a reasonable amount about security I found this a bizarre fusion of ideas. The book starts with the idea that information security has been underserved by traditional fantasy. Which if you dissect the statement, it verges on the ridiculous. I might as well have said that cellular communications have been underserved by 1930s film noir. So the background bolts on a pseudo-networking concept, and then proceeds to expound on issues such as asymmetric and symmetric encryption with the ruthless efficiency of an introduction to security textbook. It seems to be selling well, and I salute the writers for taking the bold step of bringing together two completely unconnected niches. However while I bought it I found the whole thing an unsatisfying, and frankly tedious exercise. There's a reason that the fantasy trope exists, and while there's nothing wrong with pushing the boundaries in this direction (say as in Numenera with its datasphere) this one felt cobbled together. I'd also add that it felt...See more like work, but that's a purely personal gripe. So gutsy, but one thing really doesn't go with the other; at least in this particular game. Bummer! Sorry you didn't dig, but thank you for taking a chance on an indie title. Hey. You guys did the work - I know many people will derive enjoyment from it. Regardless of my thoughts I only wish you the best. As someone who has been content to borrow game books from friends in the past, I'm very happy to be able to buy a copy of this for myself (pdf, there's not much room in my flat for dead trees). I work on a project called CryptPad (cryptpad.fr), and I greatly appreciate the work the authors have done to make Cryptography more accessible to a wider audience. I'll be sure to spread the word about this! That's fantastic to hear. Thank you for supporting the game, and doing your own work to protect privacy and personal liberty. So it says that you've got the orc killing covered, but I'm finding little or nothing about how physical combat works in the game. Maybe I just missed it? This game looks amazing otherwise! Thank you for buying a copy and I'm glad you like what you see! There is a chapter called Combat covering the basics. There is a chapter called Threats cover various adversaries, including orcs. There is a chapter called Talents, covering many, many things that make characters unique, including a handful of fun combat perks. There is a chapter called Magic, which includes a handful of traditional fantasy spells (fireball, etc. ), though most have an emphasis on espionage/stealth. All those together = all the fantasy violence you can stomach. Haven't actually purchased the game. I wasn't clear in my original comment... I was looking for previews that might explain those systems a little. Not that it matters much, as the game looks cool enough to buy regardless. Thanks for the reply! Check out my review to go over the mechanics including a limited combat scenario. I see two files with the same name. Is there a difference between them? One has bookmarks, the other doesn't. Sorry for the confusion, I will remove the non-bookmark copy soon. Added Bookmarks to the PDF. Also, if you are a customer who accidentally ordered the Hardcover instead of the Hardcover/PDF combo, contact us at cryptomancer.actual [AT] gmail [dot] com. Please please please add bookmarks to your PDF. That's fair! We'll start working on that. Pretty sure that when we push changes to the PDF, there is an option to notify folks who bought it already to re-download the new version.